The future of fashion shows up everywhere—in movies, advertisements, and editorial photo shoots. Most of what is dreamed up is some sort of high-functioning, hard-lined design that promises all the technology we have yet to think up. Francis Bitonti is one of the people doing the actual thinking—not only for the fashion industry, but the entire industry of manufacturing. 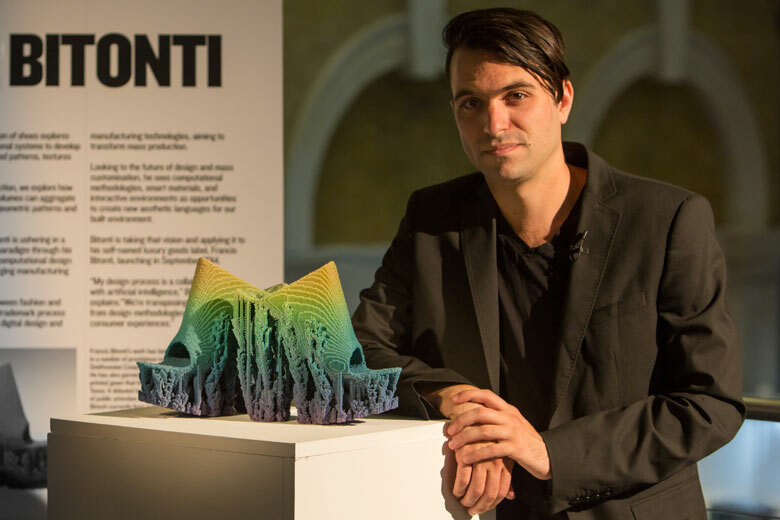 Bitonti is the name behind Francis Bitonti Studio, a design studio focused on "emerging models of mass production and processes for material formation." Of the many things the studio focuses on, 3D printing has proven a newsworthy endeavor. Something you might remember: His 3D-printed gown for Dita von Teese. In talking to Bitonti, you can tell he's an educator above all else—which makes sense, given most of his early career was spent as a design professor. But that didn't stop once he solidified his own studio. Bitonti still holds workshops for students looking to learn about the future of emerging manufacturing models and how to utilize them. Ahead: We chat with Bitonti on the state of the fashion industry, where design schools fall short, and more.